A year and a half ago, the indie film Animals was filmed in and around Uptown, written by and starring former Uptowner David Dastmalchian. His thank-you note to those in Uptown who helped the production is here. After playing at the SXSW Festival and receiving a Special Jury Prize for Courage, the film is now screening in cities across the U.S. and on Video on Demand. It will premier next Friday at the Gene Siskel Theater in Chicago. The New York Times has a review of it here, and an interview with David here. The movie's website is here. If you'd like to see the film, you can buy advance tickets through it. David and director Collin Schiffli will take part in a discussion following Friday's showing. 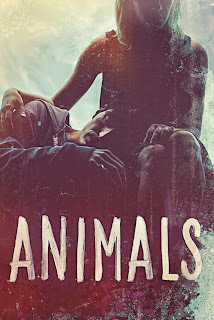 Ok I saw "Animals" earlier and liked it. The movie.......I didn't stop at the Farm in the Zoo.......I save that for late night St. Paddy's Day......it's a T R A D I T I O N.
It's an interesting movie whose main theme could be described as "DON'T USE HEROIN". Let me repeat..............don't F'n use F'n Heroin. Ever. Now since the Siskel theater didn't provide a remote control for me to rewind I only noticed one scene CLEARLY filmed in Uptown. They filmed directly behind the Uptown Baptist Church in the alley with the "Christ Died" sign clearly visible at points. It was a disturbing scene in a disturbing movie. Did I mention not using heroin? It wasn't even in the top two most disturbing scenes though. Maybe it was number 4. Here's a nice review I ran across in New City on the film which has lots of good things to say about Uptown and some of the people and businesses here. Ric Addy, the alderman, FLATS and Weiss hospital are mentioned. No mention of the twerker. How they missed that I don't know. I guess they only wanted art house success and not the kind of megahit that having Littleton twerk in their ad campaign would have provided. "In a world filled with pain and degradation ONE man stands against the tide of evil. ONE man twerks for justice. He's unstoppable. He's relentless. His booty will take on all comers. Jeff Littleton in "Mad Jeff: Fury Curb Cut." They might have had to rework the script a bit and of course the inevitable sequels and prequels. Ya know it just occurred to me........Sonic wasn't around in 2013 when filming was done. What a loss for cinema buffs everywhere. It might be best anyway. Perhaps we should keep the twerker just for ourselves. Letting him out into the world would be like giving up our own ELVIS and then later we would be overwhelmed with tour buses coming to see his former haunts.